Mencap in Northern Ireland’s dream of building a centre for children with a learning disability and their families took a big step forward on 27 November when Derek Lewis Mencap’s chair, cut the first sod at the official ground-breaking ceremony in Newtownbreda on the outskirts of Belfast. The £4.6 million centre will bring the therapeutic care, information and support children with a learning disability and their families need under one roof. At its heart will be Mencap’s relocated Segal House nursery for 2 to 4 year-olds with a learning disability, autism and developmental delay. Mencap’s chief executive, Jan Tregelles, joined over 100 guests for the celebration that saw 3-year-old Gemma McKinley, who attends Segal House Nursery and Peter Livingstone, who was at the nursery in the early 1990s, ably assisted Mencap’s chair to cut the first sod. The Mayor of Castlereagh, Alderman Jack Beattie and Brian Ambrose, chair of Mencap’s Big Step Forward public appeal also assisted in the ground-breaking ceremony. On his first visit to Northern Ireland since his appointment as Chair of the Board of Trustees in August, Derek Lewis said, “This is a big day for Mencap. When it’s built, our new centre will ensure that children and families get the support they need as early as possible – crucial in making the biggest possible impact on families’ lives. Speaking at the ceremony, Peter Livingstone, who was one of the thousands of children who have attended Segal House Nursery since it opened in 1969, said he was really pleased to be able to take part in the ceremony. “I am very excited about the new centre and I think it will be spacious and better place for the children. When I was at Segal House I enjoyed playing and learning and making friends and it really gave me a good start in life,” he said. Paschal McKeown, acting director of Mencap in Northern Ireland said, “This is a very special day for everyone in the Mencap family and one that we have looked forward to for many years. “As we have outgrown the Victorian building we currently use, we need to move to a modern, flagship, purpose-built facility that people with a learning disability and their families need and deserve. “Working alongside health, social care and other professionals involved in the life of each child and family, the new centre will deliver an integrated, holistic service under one roof. It will also provide families with the emotional and practical support they need, while promoting the development and independence of children and young people with a learning disability and their full inclusion in the life of their community,” she said. 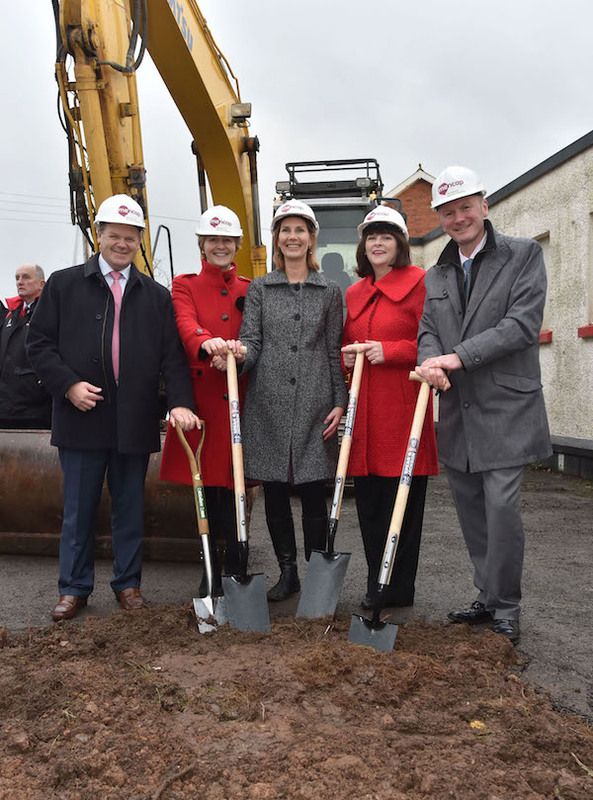 The new centre is being designed and built by the Belfast-based company Mascott Construction who began the demolition of the old Newtownbreda Primary School this month to make way for the new centre. Be the first to comment on "Sod cutting ceremony begins to turn a dream into reality for Mencap in Northern Ireland"